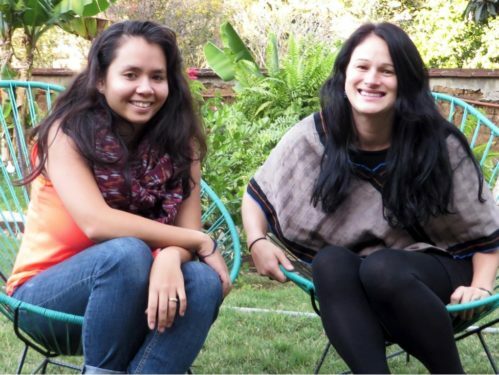 One of the first photos of Devi and Ruby, the first co-directors of FRIDA | The Young Feminist Fund, together in Oaxaca, December 2013. When Ruby Johnson was first hired at FRIDA | The Young Feminist Fund in July 2013, she was the only full-time staff member. With the support of incubating partners AWID and FCAM, and FRIDA Advisors, she quickly recruited Devi Leiper O’Malley in November 2013 to join her in FRIDA’s first co-leadership structure. Since then, Devi and Ruby have been working in a virtual office, with Devi living in Cambodia; South Korea; and now Rabat, Morocco; and Ruby based in Oaxaca, Mexico; her home city of Sydney, Australia; and many places in between. In less than three years, they have built a team of seven young women throughout the world, working with fifty advisors and over ten part-time consultants, established FRIDA’s first board, granted to over eighty young feminist led groups around the world, and grown the organization’s budget from 250,000 to over 1,000,000 USD. In this dialogue, they share their tips and reflections on how they make the virtual co-leadership structure work. 1. Claim your spirit animal: Understand your unique contributions, accept your limitations, and build a collective leadership style. Ruby: Early on, Devi and I did a personality test. It was kind of funny as we realized our “types” were actually polar opposites, although we both bobbed in the middle, and much of our tendencies mirrored each other. We have found it is important to try and reflect on your own challenges and strengths and work out how to support the other person in theirs. It is helpful to work out where you are being a bit crazy or unreasonable and reflect on that practice and try to shift it a little, being aware of your effect on other people. Coming into the leadership role for the first time, it has also been about being comfortable with what is our collective style of leadership. That it doesn’t have to be like everyone before us or everyone after us, and that it doesn’t always have to be about us stepping up, or being in the limelight, or being the face of FRIDA. Because in our case, it has been about being deliberate about opening space for our other staff members, advisors and grantees to take up space. Our leadership is about showing that is OK to be a bit shy, apologetic when you speak publicly—or, as I call Devi, the “quiet dragon,” as you can channel a power that sometimes you didn’t even know was there. It is also about sharing power and modeling collective leadership. The main thing for us has been about finding your flow, working out what you bring and holding that, strong in your heart. Devi: If I’m the quiet dragon, then I’d call Ruby the “meticulous dolphin”—excited to explore new possibilities and to turn over every detail. I have distinct memories of when I have felt ready to give up or say “no” on a task, but Ruby picks me up and says, “Come on!” I am grateful for this because it has resulted in amazing things (like winning the biggest grant ever for FRIDA!) Meanwhile, I try to help us remain calm as we navigate the sometimes-choppy waters of dealing with different personalities in the people we have to work with. One of the mantras I’ve picked up during this time has been, “Exhale your fears and breathe in your courage.” As I’ve walked this journey, I’ve learned to share my worries with Ruby, which, to be honest, was hard at first, because if there is anyone I want to prove myself to, its my co-leader! Through the ups and downs of our work together of overseeing one of the biggest participatory grantmaking funds, working late in the night to submit a concept note by morning, and trying to select awesome new team members from a stellar pool of candidates, I’ve been able to draw strength from Ruby’s passion, dedication, and openness. Our leadership is an ongoing project of sharing and trading power. Dragon and dolphin together; I think we make an amazing beast! 2. Get clear on what decisions you share and which you do not. R: We are still working on this one, but I think it has been really key to mastering the working virtual as co-leaders. Devi’s core area is resource mobilization and communications, while mine is in programs—FRIDA’s grantmaking and capacity development. We share the advocacy work and all the management pieces such as finances and human resources, splitting things here and there. D: We’ve made use of different charts and tools to help us map out where each of our responsibilities and accountabilities lie. Especially as we have grown the staff team, this has become imperative so that people know who to go to for approval and consultation. Often, we find ourselves regularly turning over decisions together, and if the conversation goes on too long, we tell each other, “This is what I think, but it’s your call.” Having this clarity supports our own efficiency as a team, and enables us to trust each other on a regular basis. R: One thing unique to FRIDA’s virtual situation that we’ve had to manage is that co-leadership across so many time zones can slow us down. Decisions take longer when you need to wait for the other person—and, in our case, literally; we need to wait 12 hours until the other person has woken up—to decide. In addition, matching our energy, focus, and mood over a 12-hour time difference is hard when we need to connect on important decisions. We have learnt to be stricter with our time, blocking periods in our calendars where we cannot have calls. We also use some core platforms to manage our shared work, such as SmartSheet, Asana, and Slack. As a virtual organization, things like this have been essential. I have also tried to spend more time in a closer time zone to Devi, and this has helped us have intense periods of closer collaboration throughout the year. R: Of course, it has its challenges, but working so closely with someone, and having equal decision-making opportunity, has been one of the most beautiful experiences of professional and personal journey yet. Even though Devi and I are worlds away geographically most of the time, it really feels like Devi is next to me. I always wonder what she would think. 3. Look after each other: Prioritizing our collective well-being. D: We are both committed to the principle of self-care and try to make sure our entire team prioritizes this. Our movement is full of examples of activists that have put their work above their health and well-being. Though their passion is incredible, it can create a culture of burnout, and this is something we definitely want to change for our generation and the next. Admittedly, I haven’t always been the best at this. Even though I am aware of burnout and the slippery slope that leads to it, I found myself suddenly in the depths of one in 2015. Without Ruby’s unwavering support and generosity (as well as life coaching and some time off from work), I have to wonder whether I’d be here today! A co-leadership model really offers built-in peer mentoring. We each have, and serve as, a safety net, someone to stop you from going over the edge, to hold you accountable, and keep you sane. D: Also, being the leaders of the Young Feminist Fund, we have found ourselves to be the youngest people in the room. Though we almost always feel welcomed, sometimes an interruption or offhand remark can cause one of us to wonder if we are being treated differently because of our age or other identities. Being able to check our self-doubt or indignation with each other makes us better people. R: Another thing is that throughout the journey so far, we are getting better at saying “no” to things, being clear about our own limits, and asking for help. We have both been having some coaching on and off for the last two years with incredible coaches who have guided us to be stronger in saying “no,” having more self-discipline to take time to stop and remember what you are doing, and helping to make a path to fix things. Also, reaching out to executive directors from some of the sister women’s funds and women’s rights organizations and asking for advice has been invaluable. D: Dedicated to this structure of co-leadership, Ruby and I have had to push against the status quo. Often, in our work, we find documents that only make a space for one person’s signature. We deal with this in different ways—sometimes choosing the most appropriate of us to sign, other times negotiating with our partners and reformatting the document so we can both sign. Similarly, when we get invitations to speak on a panel as the director of a fund, sometimes it’s obvious which one of us should accept the invitation, sometimes it’s not. We’re proud of the times we’ve successfully asked for both of us to speak together as a duo. R: One image for me that encompasses our journey at FRIDA is the idea of jumping into the unknown, like jumping off a beautiful cliff with warm turquoise waters below. I think the fact that we have done this together, with other important people by our side, like Angelika Arutyunova, like Ana Criquillion, like Perla Sofia Vasquez [Díaz], like our amazing team…it has given us strength to take some more risks and made things a bit less scary and way more fun. We have also tried to make sure we build in practices of experimentation: Try something, and if it doesn’t work, try and change it, and be comfortable with accepting that it didn’t work. D: We are still working on how to best manage this culture of experimentation so that when we fail, we “fail fast” by being quick and ready to change course if needed and document and share lessons learned. We want to make sure that everyone in the FRIDA community embraces this culture in order to amplify the inner creativity and resilience of each staff member, grantee partner, advisor, board member, and even donor. This is why we have invested heavily in Monitoring, Evaluation, and Learning. Due to the fast-paced nature of our work, our mistakes and learning are probably best captured on our Google Chat archives, but we are constantly exploring different ways to do this, from trusted databases and reports, to fun videos, artwork, and mobile apps. This article in itself is a long-awaited opportunity to do some reflections together! 5. No one person has all the answers. It is OK to ask for help; after all, collective knowledge, power, and celebration are everything! D: We also recognize that we are stronger through the incredible commitment and dedication of the team of young feminists we have the privilege of working with. The staff and consultants show up every day, ready to ride the ups, down, and loops of this dragon-dolphin roller coaster, all the while helping to build parts of it themselves. The same goes for our advisors, board, and grantee partners who join us in creating FRIDA. I think we all wonder where FRIDA has been all our lives and the generations before us, and we are working hard to make sure it exists for the generations after us—until it’s no longer needed! Devi Leiper O’Malley is co-director of FRIDA, the Young Feminist Fund. Devi is a young feminist activist from Cambodia and the United States. For three years, she worked for the Asia Pacific program at the Global Fund for Women. During this time, she also co-founded the Devata Giving Circle, the first Cambodian-American giving circle. Most recently, she has been consulting for various philanthropic organizations to organize a feminist movement-building conference in Cambodia and participate in resource-mobilization dialogues with feminist activists in Indonesia and the Philippines. She is currently based in Rabat, Morocco. Ruby Johnson is co-director of FRIDA, the Young Feminist Fund. Ruby is a young feminist activist from Sydney, Australia. Ruby spent two years living and working in Cambodia with UN Women in the area of governance, CEDAW and women’s human rights, in particular supporting young Cambodian women’s leadership and advocacy. Before this she worked with Amnesty International in Australia for three and a half years in human rights activism, social mobilization, and campaigning. Ruby switches between Mexico and Australia. The Metropolitan Museum of Art has named a new director after a yearlong search. Their choice is telling in a time of intense competition among artistic institutions.